Lewis Rice member Bridget G. Hoy was elected President of the Board of The Women Lawyers' Association (WLA) of Greater St. Louis for 2016-2017. Bridget will be installed as President at the WLA 40th Anniversary Gala on September 10, 2016. The WLA works tirelessly to promote women in the St. Louis legal community, and Bridget improves that effort by advocating for gender equality as well as the retention and promotion of women in the legal profession. Bridget is a member of the litigation department at Lewis Rice. 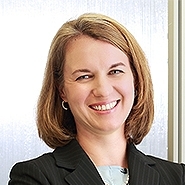 As a trial attorney and mediator, she regularly navigates her clients through contract, consumer fraud, personal injury, trademark, patent, and other legal issues to successful outcomes.